Pakistan Cricket team has reached the ICC Quarterfinals by beating the Zimbabwe in its fifth Group Match on Monday 14th March 2011 by 7 Wickets. The Match was played in Kandy Sri Lanka where Zimbabwe played first after winning the toss. The matches was reduced to 38 overs for each team due to massive rain. Zimbabwe scored 151 runs for losing 7 wickets in 38 overs first. 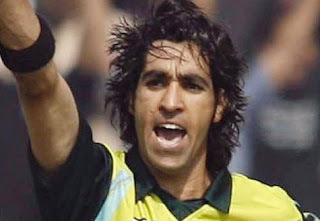 Pakistan got the needed total for loss of 3 wickets in 34 overs.Umar Gul got man of the math award for his 3 wickets. Pakistan has now one Group match left against Australia.